Do Green Homes Measure Up? Builders and real estate agents alike know that environmentally-friendly, or green, homes are on trend at the moment, and they are only expected to increase in popularity. But what few Americans know is what it's like to live in a green home. 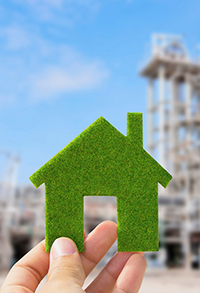 The National Association of Home Builders recently commissioned a survey of homeowners living in National Green Building Standard-certified homes to see whether they were satisfied with their green purchases. And the overwhelming response was positive. Of those surveyed, 94 percent would recommend a green home to a friend, and 92 percent would purchase another green home in the future. The survey asked green homeowners which feature of their homes they were the most satisfied with. It turns out many homeowners wanted to save their budgets along with the planet; 25 percent replied they were most satisfied with their low utility bills. Just as many homeowners—25 percent—were pleased with their homes' energy efficiency. And 22 percent of respondents thought their homes' improved insulation was the feature worth bragging about.